Today’s weather forecast in Tokyo is nothing like the opening of the new term, ‘Keichitsu’ as the estimated maximum temperature is below 11 degrees Centigrade (52 degrees Fahrenheit). Raining since late last night and cloudy sky also gives us ‘winter-cold’ images. Still, the name of the term is something that really reminds us of ‘spring is here’, the opening of the holes or dens of hibernating creatures. The name given to this term, ‘Keichistu’, is a noun made from two verbs, ‘Chissuru’ and ‘Hitraku’. Both verbs are old which we rarely use now, may only be seen in classical poems and verses. ‘Chissuru’ is a verb describing the hibernating action of creatures in their holes or dens during winter which is also used for people who live in seclusion or retire and live in places out of villages or towns into the countryside being bothered by neighbours. ‘Hiraku’ is a verb meaning ‘to open’ but the kanjiW (Chinese character) used in this verb, pointing out the action of ‘the opening’,especially, stresses the meaning of ‘the opening of the dawn’ or ‘the opening of the yang, the positive qiW, of Yin and yangW philosophy’. Because the kanji used for ‘Hiraku’ of this season has such positive meaning, it is used a lot in names of both Japanese male and female. We are sure by now that you grabbed the image of the term today by knowing the real meaning of the kanji used. The term is mentioning the atmospheric change, not only those of temperature but those of spiritual power of the universe, which is turning into positive to the creatures. But on a cold rainy morning like today, we wouldn’t blame those who still want to stay warm in their bed! Yet hoping that they won’t be too late to their business…. Unlike the past few weeks at last, the weather of Tokyo this weekend is just like the those of nice warm spring. Lovely sunshine but not hot with nice fresh breeze with a slight scent of the fresh green, even in the middle of the city though for those who suffer from hay fever must beware as tons of cedar pollen is drifted in the air. We will be expecting ‘Higan’, the equinoctial week in which Buddhist services are performed, from this coming Tuesday, 18th March, which is thought to be one of the critical juncture of weather temperature in Japan and it really is right! It is hard to find slight changes of the season in the middle of the city but by looking at some of the cherry trees lining a street, we could see that their buds have swollen more this weekend. In the countryside, vast changes are easily found as the ground is still plain with less green in the nature at this time of the year and one of them must be insects again into action. In the past article, we have mentioned that there are various kinds of insects existing in Japan. To those who hate bugs would be the awful season’s start in Japan but to those who don’t give a damn or those who love them should keep attentions to the insects you see outside the cities of Japan to really enjoy the seasonal changes as well as deepening your knowledge to Japanese culture as like the season phrase today. ‘Namushi’ is a word made from two nouns, ‘na’ and ‘mushi’. ‘Na’ is a Japanese for Japanese rapeseed as we have written in our past article, Usui, Jikou, and for green vegetables. ‘Mushi’ is a Japanese for insects. Therefore, ‘Namushi’ is a word for insects that feed and dwell on green vegetables. More than in organic vegetable fields of today, there should have been remarkable numbers of insects feeding themselves on greens as there were no agricultural chemical. Our past farmers, at this time of the year, were starting to get busy ploughing, sowing and planting their crops, getting rid of caterpillars in the intervals. There must have been much caterpillars which escaped their danger and survived in the fields which turned into pupas and were about to emerge. 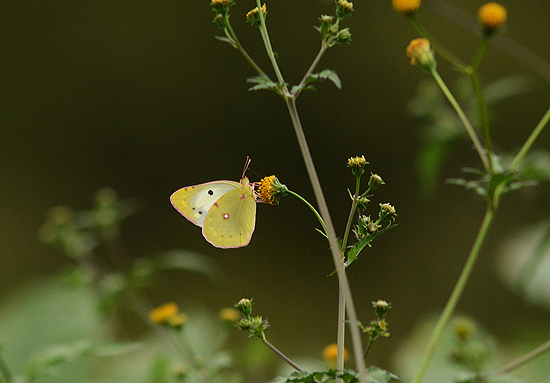 ‘Monki chou’, one of the earliest emerging butterfly in Japan. Photo from ‘Mori-no tousan kachoufugetrsu‘. Going back to the phrase, the following ‘chou’ is a Japanese noun for the butterfly. The last verb, ‘kasu’ is a Japanese meaning to change or to transform, leaving us with the meaning of the whole phrase as; the caterpillars on green vegetables transform into butterfly. ‘Benishijimi’, a tiny butterfly you’d see throughout spring and summer. As the seasonal phrase is based on the Lunisolar calendar, the season of butterflies in Japan seems a little early, especially when the weather had been colder than usual, it is hard to see butterflies at this time of the year. Still, as our search result, butterflies as ‘Monki-chou’ (Eastern Pale Clouded YellowW in English) or ‘Beni-shijimi’ (Small CopperW in English) can be found flying from late February. 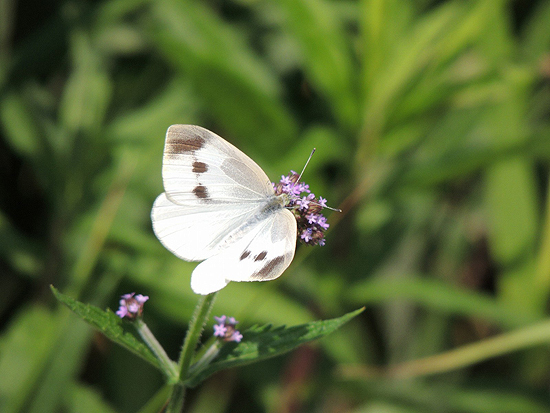 ‘Monshiro chou’, known as Small WhiteW in English is the common butterfly found flying in the fields often which most of the Japanese know as the butterfly that goes well with the Japanese rapeseed blossom and cabbage patch as a Japanese spring scenery. ‘Monshiro chou’, very common butterfly you can see in Japan. Besides butterflies, there are of course other insects in Japan which emerge at this time of the year but as a symbol of spring, no other insect could excel butterflies to the Japanese. As butterflies in Japan are quite outstanding and many are beautiful, it should have been natural for people to have kept their attention on butterflies than any other insects at this time of the year. But according to some of the records of the past, butterflies were symbols of spiritual existence which connects this life and afterlife or ancestral soul. Butterflies unlike in designs you see in Japanese arts today as popular motifs in kimonos were some sort of a taboo, a special symbol only to those who concern in sacred services as mediums or shamans. It was after Sengoku periodW that butterflies were featured as positive symbol of spring. Yet the spiritual image of butterflies existed until modern period in some parts of Japan which are left as fables. Many of them remain as stories of the returning spirits of the dead family member or as a symbol foretelling the death. 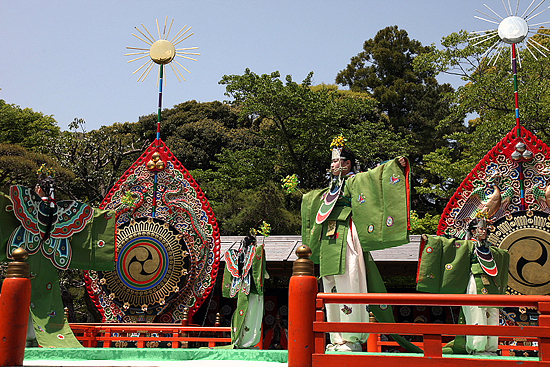 ‘Kocho-no-mai’, a dance of butterflies from foreign land, of Gagaku. Gagaku is an ancient court music and dance which was thought to have established in 10th century. 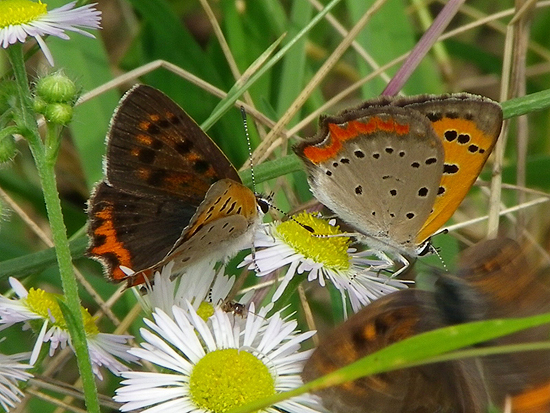 You can see here that the butterflies are taking an important role. Photo from ‘Ise Oinaina Nikki ‘. By knowing the original meaning of the season’s symbol, this season’s phrase certainly connotes deeper meanings not only describing the workings of nature by vision but how important the vernal equinox was meant to our old ancestors. 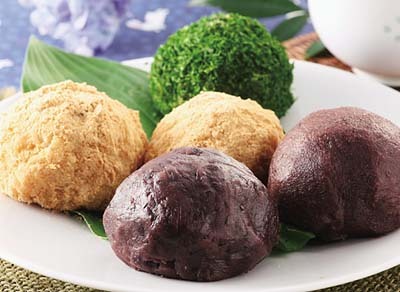 BotamochiW is a Japanese traditional sweet made from round formed rice balls covered with ‘anko’, the sweet azukiW paste. There are several views on the naming of this sweet but the general view is because this sweet was a sweet especially served in the period when peony, known as ‘botan’ in Japanese, blooms. It is a sweet served in ‘Higan’ of spring, the equinoctial week in which Buddhist services are performed which still is a sweet offered to family ancestors, placed in Buddhist altar at home or in grave. This custom first was thought to be a service of the ancient belief of old family ancestors, mountain or harvest gods called ‘Sorei shinko’, known as Veneration of the deadW which combined with Buddhist belief of this life, ‘Shigan’, and after life, ‘Higan’. Typical Botamochi in rough ‘anko’. Something you would see people making them at home in the countryside. Photo from ‘JA Kyoto Official Site‘. It wasn’t a sweet for us to eat in the past but for our dead ancestors and mountain or harvest gods in the past. You will see that the sweet has a meaning of keeping away the evil spirits by the ingredient, azuki beans, used not inside like many other Japanese sweets but outside so that the red colour of azuki is obvious. Red was a colour which was thought to avoid the evil spirits, azuki beans which colour is red, been valued as protective charm food. There is another similar sweet which is served like Botamochi, called ‘Ohagi’, in the ‘Higan’ of autumn, around autumnal equinox. Both Botamochi and Ohagi are quite the same (though differs at some parts of Japan) but has different names because the serving period is different. 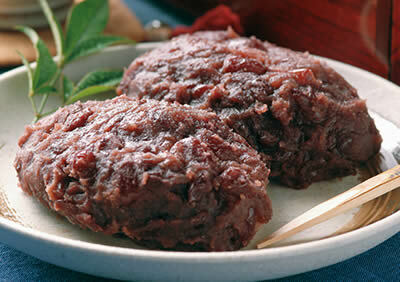 Ohagi is thought to be named after ‘hagi’, bush cloverW in English, as the period is the time when ‘hagi’ blooms. Botamochi in other styles. Botamochi covered in smooth ‘anko’ on the right and Botamochi covered with ‘kinakoW’, the soybean flour, on left. Photo from ‘JA Kyoto Official Site‘. You can buy Botamochi at most of the Japanese confectionery shops in Japan at this time of the year which you ought to have a try if you are in Japan. Of course, they are made for us to eat though many still offer them in their Buddhist alter at home first before eating. There are still many houses in the countryside where they make their own Botamochi at home which is served among their relatives and friends who visit during ‘Higan’ week.